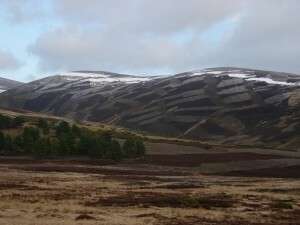 Much of the moorland in the National Park is actively managed and characterized by a patchwork pattern of heather burnt in strips across the hillside. Burning takes place outside of the summer months when birds are breeding on the moor. The idea of the burning is to create a mix of habitat which provides long heather and shrubs like Juniper for birds to shelter in and short fresh green heather for them to feed on. In some places, management of moorland is focused on achieving very high numbers of red grouse for shooting in the autumn. As well as burning, moorland managers control the numbers of predators such as foxes and crows which feed on grouse and other birds like the curlew and golden plover. Grouse have been increasingly affected by an increase in parasitic ticks which can pass on disease and lead to the death of chicks. Some moorland managers use sheep to ‘mop up’ the ticks; the sheep are then dipped to kill the ticks. Ticks are not only a problem to grouse; they can carry Lyme Disease which can be very severely debilitating and even life threatening to humans too. It is recognised today that well managed moorlands are an internationally important habitat that can contribute to maintaining many different species of wildlife including the mountain (or blue) hare, hen harriers and golden eagle. It will also contain areas rich in scrub species like juniper and willow and wet areas rich with many species of sphagnum moss providing a bounteous food source of insects for grouse and wading birds.